4-Deck DJ MIDI controller with 4-channel audio interface. The CMD Studio 4A provides all the tools needed to learn the basics of DJing. This is no crippled budget controller; Studio 4A has similar features to what you™ll find on bigger, more expensive controllers. 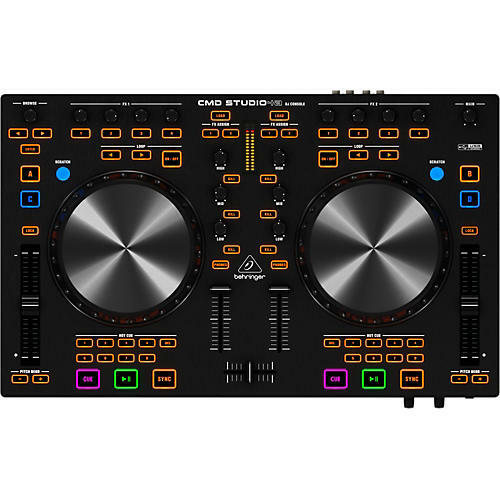 Industry standard fader sizes, properly proportioned jog wheels, and a built-in sound card make the CMD Studio 4 a great entry-level DJ controller. Tiny pitch faders just feel wrong, so Behringer decided to include industry standard 100 mm faders for Studio 4A's pitch controls and 60 mm channel faders that translate into much smoother mixes. Another area where most controllers fall short is platter size. The trend is smaller and smaller platters, in an effort to knock the overall size of the controller down. But Behringer gave the Studio 4A 6" touch sensitive platters that work the way you'd expect. After the faders, the platter is your main contact point on a controller “ shrinking that down to a tiny little rubber disc just isn™t satisfying. The Studio 4A has a 4-out USB sound card built in, so you're ready to go right-out-of-the-box. This quality audio interface has 24-bit converters and provides ultra-low latency operation in either Windows or OS X. No one wants to look up at the DJ and see him looking at his computer screen like he' updating his Facebook page. And as a DJ, you don™t want to be forced to constantly look at the computer instead of reading your crowd. The CMD Studio 4A addresses this by incorporating plenty of MIDI feedback. That means that if a button is lit in your software, it' also lit up on the Studio 4A. Great choice for starting DJs. Order the Studio 4 today.